Communicating is considered vital since it can make or break a relationship. Be it within the family, or your circle of friends, or loved ones who had been so far. Trying to find the best communication medium is a must to keep in touch. There are many types of communication that we can use these days when we try to keep in touch. Keeping in touch is very important to have a healthy relationship not only with couples with family and friends too. Verbal communication includes sounds, words, language and speaking. Language is said to have originated from sounds and gestures. There are many languages spoken in the world. The basis of language formation are: gender, class, profession, geographical area, age group and other social elements. Speaking is an effective way of communicating and is again classified into two types viz. interpersonal communication and public speaking. Good verbal communication is an inseparable part of business communication. In a business, you come across people from various ages, cultures and races. Fluent verbal communication is essential, to deal with people in business meetings. Also, in business communication self-confidence plays a vital role which when clubbed with fluent communication skills can lead to success. Non-verbal communication involves physical ways of communication, like, tone of the voice, touch, smell and body motion. Creative and aesthetic non-verbal communication includes singing, music, dancing and sculpturing. Symbols and sign language are also included in non-verbal communication. Body language is a non-verbal way of communication. Body posture and physical contact convey a lot of information. Body posture matters a lot when you are communicating verbally to someone. Folded arms and crossed legs are some of the signals conveyed by a body posture. Physical contact, like, shaking hands, pushing, patting and touching expresses the feeling of intimacy. Facial expressions, gestures and eye contact are all different ways of communication. Reading facial expressions can help you know a person better. Written communication is writing the words which you want to communicate. Good written communication is essential for business purposes. Written communication is practiced in many different languages. E-mails, reports, articles and memos are some of the ways of using written communication in business. The written communication can be edited and amended many times before it is communicated to the second party to whom the communication is intended. This is one of the main advantages of using writing as the major means of communication in business activity. 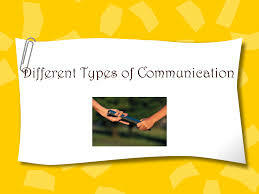 Written communication is used not only in business but also for informal communication purposes. The last type of communication is the visual communication. Visual communication is visual display of information, like topography, photography, signs, symbols and designs. Television and video clips are the electronic form of visual communication. Effective communication is essential for the success of any type of business. Informally too, nothing can be achieved without proper communication. Therefore, developing communicative skills is a must. One must understand that all the four types of communication are equally important and one must develop communicative skills in all the mediums. Communicative media is growing day by day to ensure clarity and to eliminate the ambiguity in communication.